The Veil is a modern/medieval fantasy mash up where the players are welcome to be… well… anything really! Earth and Yrimar have been separated by a magical barrier known as The Veil; after many years of keeping the world of magic and the world of science separate The Veil has begun to fracture, its magic has begun to wane though the reasons behind this remain unknown. 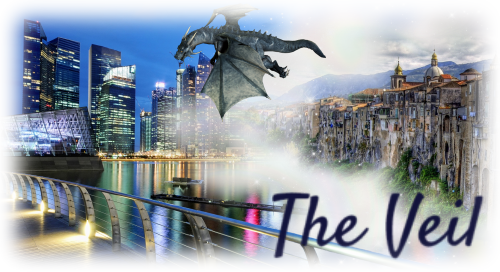 Creatures of all shapes and sizes have begun to trickle through to Earth side and vice versa when rips in The Veil randomly appear… unfortunately now there’s a permanent one in Singapore that leads to the continent of Belacia. So why not come and join us? Become an Elven mage and work with the special Police Unit Earthside dealing with those coming through The Veil, become a normal human and stumble into a cavern full of Ogres in Yrimar. Be whoever/whatever you want to be. Try to restore The Veil’s magic or even destroy it completely. Bonds to other creatures are also available – come with a Bond already made or discover your true other half when you arrive!